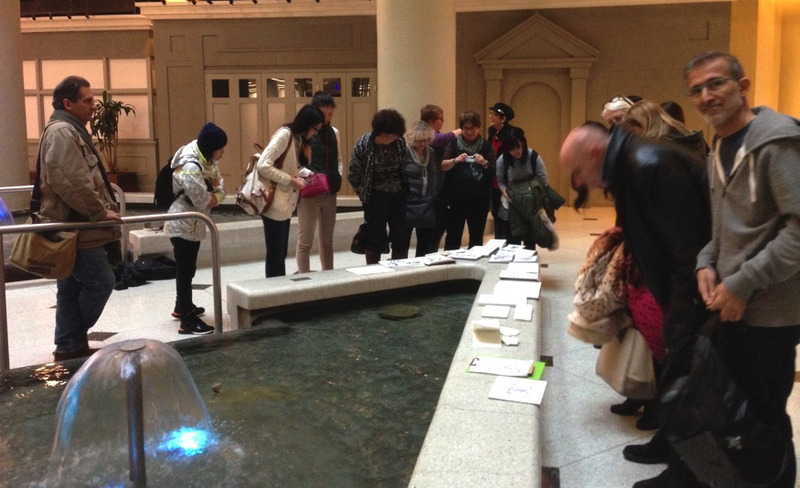 It's always a bit of a challenge to find a new and interesting place to host an urban sketching event in the winter, specially as the group keeps growing. I tend to spend hours online searching for new places and planning the day around it. 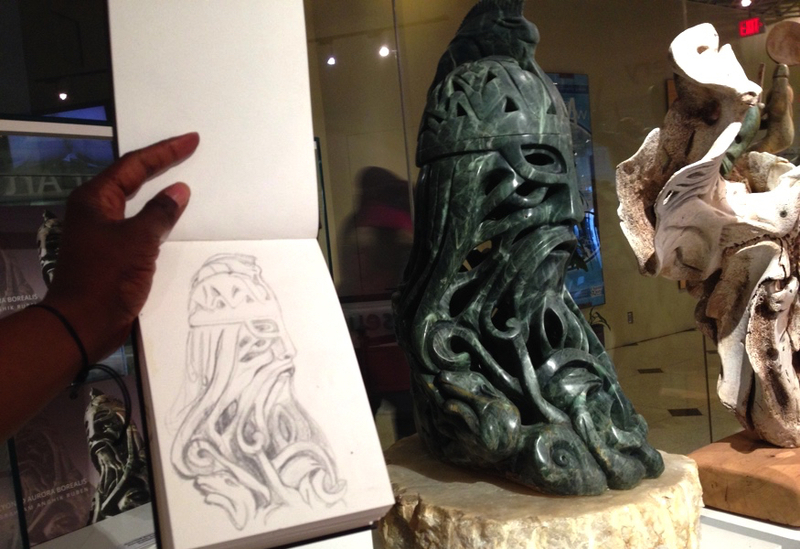 Fortunately I came across the Museum of Inuit Art and despite its relatively small size, it looked like there were quite a few interesting sculptures for everyone to sketch, so it was chosen as the first sketching destination for 2016. I've always been curious to find out more about the culture and history of natives, as I find it's not a topic that is readily available to non-natives, so the fact that this museum exists definitely got my attention. What an awesome place! I love the modern minimalist design of the space which is a great backdrop for the intricate artwork in the museum. It is meant to evoke the ice flows, snow drifts and wind swept tundra of the Canadian Arctic, so that Inuit art can be appreciated with some sense of the environment in which it was created. As the organizer, I often only have time for one good sketch, so after greeting the participants and taking pictures and videos of the space, I chose to sketch a piece from master sculptor Abraham Anghik Ruben called Beowolf, made out of Brazilian soapstone. It just captured my attention right at the entrance of the museum. The receptionist was amazed that I could stand there for an hour or so, just fixated on the sculpture. There's something interesting that happens when you start sketching something like this, at least for me. I get in some sort of trance where only me, my thoughts and the object I'm sketching exists and I start discovering all kinds of things I wouldn't have if it wasn't for essentially interacting with that subject. In the case of Beowolf, I was intrigued by all its intricate parts and how the openings create intense contrasts. And then I noticed all the little creatures embedded in the sculpture like a mix between a rabbit and a chameleon on top of his head, a pig nestled on his side, a dolphin and a bird closer to the front, and other animals I probably missed on the other side. I worked a little more on the contrasts and the details of my sketch, carefully noting where the darkest area were so that I could complete it later on at home, as I knew I wouldn't have enough time that day to finish it. Later on, I went over my drawing with a water soluble Inktense pencil . Using a water brush, I then increased the contrast of the sketch and added a green and blue wash over it. We had a great turnout. A little over 20 sketchers took part in this event and many, including myself, plan to go back again in the near future. I also was made aware of two other places where we can see more native art in the city : the TD Gallery of Inuit Art and the Bay of Spirit Gallery.